ELLENSBURG, Wash. – Cody Webster has earned many accolades during a stellar bullfighting career. He added another Friday night by becoming the first Bullfighters Only-Ellensburg champion with a strong bout with 12x and Costa’s Murder Ink – the duo moved around the Ellensburg Rodeo arena dirt in a brisk dance of athleticism that resulted in an 86-point bout. “This is awesome,” said Webster of Wayne, Okla. “This is my third or fourth year of getting to come to this great rodeo and protect the bull riders. Now they’ve added the bullfights and made it even better. Dusty Tuckness of Meeteetse, Wyo., started the night of fights, producing a 78-point mark. 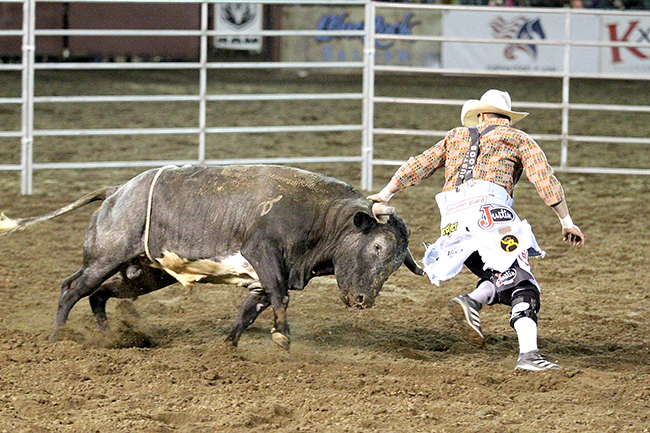 Nate Jestes of Douglas, Wyo., was the second bullfighter and scored 80. When the bull put Jestes in a tough position, the bullfighter scrambled up the fence to safety. That typically affects the overall score negatively. By being aggressive, the Oklahoma man forced the bull to stay with him tightly. Webster made a series of rounds as Murder Ink stayed on Webster’s heels. Once the bullfighter earned a little separation, he was able to show off more moves, including a solid step-through. As he closed out his 60-second fight, Webster earned the separation he needed to finish the bout by jumping Murder Ink. It made for the perfect ending to a top-notch evening of rodeo and bullfighting. As the No. 1 bullfighter in the BFO, he added $1,500 to push his season earnings to $22,237. Jestes, who sits in second place in the standings, moved past the $20,000 mark with his second-place finish in Ellensburg.